When Jesus was resurrected he proved to the world that he lived a perfect life as a servant by dying on the cross for our sins. In this final part of the “Servanthood for Kids Series,” kids will become intimately aware of the assurance we have in salvation and in God’s promises for the future. In addition, they will be encouraged and gain confidence in their ability to serve because we have a risen Savior! OBJECTIVE: To identify Jesus’ resurrection as proof of his life as a servant and as God’s son. MAIN IDEA: Jesus’ life of service was completed by his resurrection. Because he died and came back to life we can have a relationship with him and be sure of an eternity in heaven. PREVIOUS LESSON REVIEW: Ask, “Who were some of the people Jesus met as he was arrested and crucified (the soldiers, the priests and elders, Pilate, etc)? How did these people treat him (mocked, beat, and killed him)?” Assure the students that Jesus’ mistreatment was overcome by the fulfillment of his resurrection. Say, “Last week we learned how Jesus died on the cross as a servant. After his death, he was buried in a rich man’s tomb.” Read Mark 15:43-47. Ask, “Why is it strange that a member of the council would ask for Jesus’ body (because they had taken part in sentencing him)? 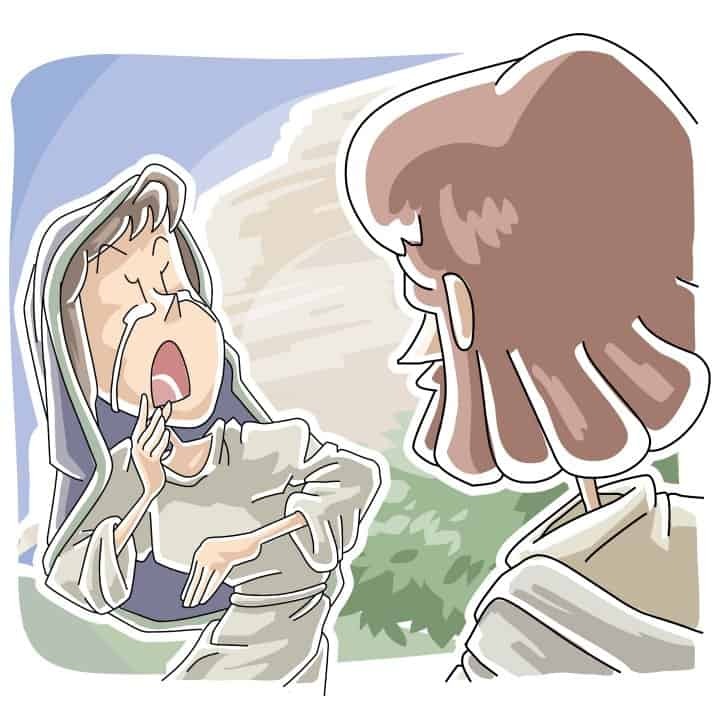 How do we know Joseph truly cared for Jesus (because he took the time to care for his body and gave him a dignified burial)?” Emphasize that Jesus’ mother, Mary, and Mary Magdalene saw where Joseph had buried Jesus, and they went to visit the tomb a few days later and encountered an amazing event. Read Matthew 28:1-10. Ask, “How would you have responded to the empty tomb and the angel’s message? What did the two women do when Jesus greeted them (clasped his feet and worshipped him)?” Explain that Jesus’ resurrection led the women to worship, and it should lead us to worship him too. Next, discuss how Jesus appeared to the disciples and other believers. Read John 20:3-8 and John 20:19-21. Ask, “Which two disciples went to the empty tomb (John and Peter)? What was their reaction (they believed)? And what was the reaction of the other disciples when they saw Jesus (they were overjoyed)?” Discuss how Jesus’ resurrection and appearance to the disciples gave them courage and boldness to preach the gospel. Then read 1 Corinthians 15:3-8. Emphasize that Jesus also appeared to more than five hundred other believers including Paul and James (Jesus’ brother). Say, “There were many witnesses who saw Jesus after his resurrection, so we never have to doubt that the event actually happened. Some of these witnesses went on to write the books of the New Testament, such as Peter, Paul, and John.” Further discuss that Jesus continued to serve and teach his followers after his resurrection to help them become the initial leaders of his church. Lastly, talk about Jesus’ ascension into heaven as his final act of service during his first coming. Read Acts 1:6-11. Ask, “What promises are in this passage (the coming of the Holy Spirit, the gospel message reaching the whole earth, and Jesus’ second coming)? How do we know these promises can be trusted (because Jesus was resurrected as he promised and we already have the Holy Spirit)? If we remember these promises then they will motivate us to serve and love others.” Read Hebrews 4:14. Explain that Jesus’ ascension into heaven means we can find strength in our faith because he is there preparing for the fulfillment of his second coming! Pass out black construction paper to each student. Say, “We are going to make a craft that reminds us to serve like Jesus.” Ask the class to write the phrase, “Your hands helped others and so can mine” at the top or bottom of each paper by using a white crayon or paint pen. Use a rectangular sponge brush to apply white paint to each student’s hand and make a handprint on their paper. Then use the round sponge brush and red paint to put a red mark in the center of each handprint to symbolize Jesus’ resurrected hand. Encourage the students to display their artwork where they will be reminded to serve others. RECAP: Jesus’ resurrection and ascension into heaven finalized his service during his first coming on earth. God equips us to lead our own lives of service by giving us strength and fulfilled promises so we will trust and act according to his will. Wow! This is wonderful stuff. I’m going to use the Servanthood series this fall and hope to incorporate some service projects with the kids! Thank you for sharing!! I am very excited and love this site!!!! !